Vise as art or Vise art? We've seen some unique vise paint jobs but this one gets the prize so far. A mantle piece for vise collectors. I found this interesting piece on ebay and asked the artist if I could use his photo. It will still be for sale until Sunday August 30 (the day after I post this). The marbling technique starts with a black base coat, then the special marbling paint and while it is wet plastic wrap is wrapped around the parts and then pealed off removing some of the second layer of paint. The vise above has three coats of clear over the marbling. I think this is the predecessor to the Columbian 33½ which has the same jaw size and weight. These are listed as a "homeshop" vise but they are plenty heavy for all kinds of benchwork. In fact they are heavier than needed for work like locksmithing and much jewelry work. They are plenty sturdy for hacksawing and filing. Perhaps that is why "Red Arrow" and homeshop were dropped. 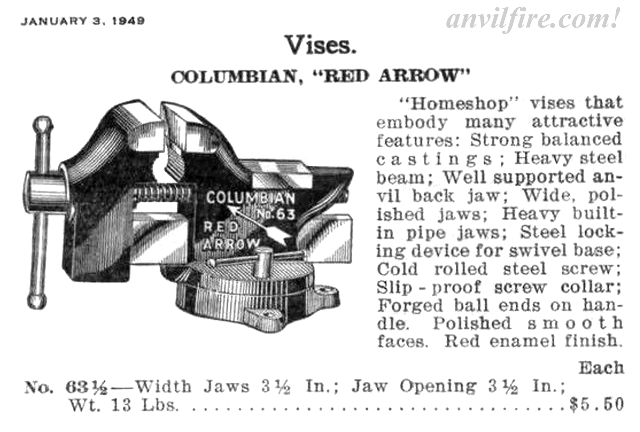 Note that the Red Arrow logo is on the opposide of the catalog engraving (red added digitally). 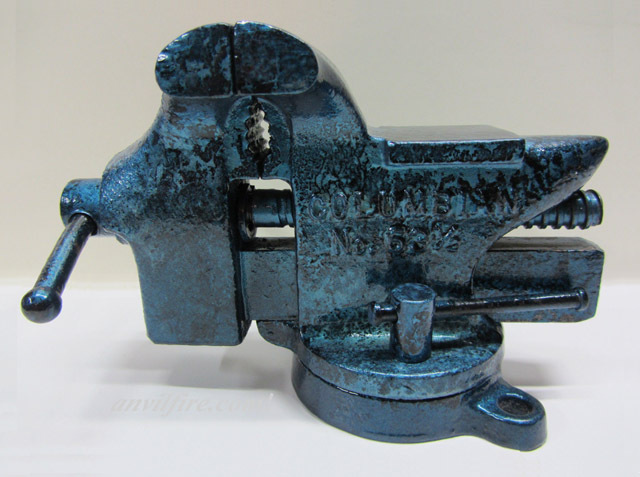 The difference may be the engraving is of a model 63, or they wanted the vise facing the same way as others in the catalog but wanted to see the logo, OR it could be a pattern chage or replacement. Who knows? Dimensions: Jaw Width = 3.5"